This position has been filled ! Please look at our other PhD positions offers ! The Center for Applied Geoscience at the University of Tübingen is offering a PhD scholarship on the topic “Fully coupled hydrogeophysical inversion of 3D tracer tomography using temporal moments and Ensemble Kalman Filtering” starting preferably before July 1, 2017. 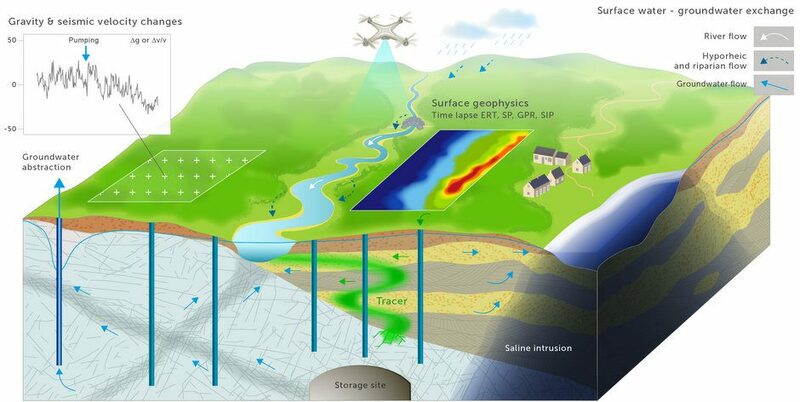 The project is funded by the Marie-Sklodowska-Curie Innovative Training Network “ENIGMA – EU Training Network for In situ imaGing of dynaMic processes in heterogeneous subsurfAce environments” within the Horizon 2020 Programme of the European Commission. ENIGMA is a consortium of high profile universities, research institutions and companies located in France, Spain, Germany, Switzerland, Belgium, Denmark, Sweden, USA and UK, and will train 15 PhD students in total (Early Stage Researcher, ESR). This particular PhD (ESR PhD 13) will be based at the Center for Applied Geoscience at the University of Tübingen with research stays at ULG Liège. Qualifications and research experience: The applicant must fulfil the requirements defined for Early Stage Researchers (ESRs): ESRs are researchers who, at the time of recruitment, have NOT yet been awarded the doctorate degree and are in the first 4 years (full-time equivalent) of the research career. 3-D time-lapse ERT will be used for monitoring of salt tracer experiments and will be combined with GPR imaging of salt-tracer tests (with a secondment to the University of Liège), transient hydraulic tomography, heat tracer testing (also using natural sources as input signal). Other geophysical surveys may be used to obtain structural information of the subsurface. Fully coupled inversion methods of the hydraulic-geoelectrical system will be developed. The innovation of the ESR project lies in the development of fully coupled 3D-inversion methods for the joint analysis of field-scale tomographic data sets from multiple investigation techniques. In this context, Ensemble-Kalman methods will be adapted as inversion techniques. Field testing requires the extension of experimental concepts for tomographic salt-tracer testing with ERT and GPR monitoring and will be validated at the Lauswiesen test site of the University of Tübingen and then applied at other ENIGMA sites (Krauthausen, Hermalle, Selke). Applicants should hold an MSc degree (or equivalent) with good results and good English skills. As criteria for the assessment of your qualifications emphasis will also be given to relevant work experience and previous publications (if any). We invite candidates from different scientific fields to apply; geophysics, hydrology, hydrogeology, hydrogeophysics, or a related discipline.. The candidate should have a solid background in geophysical methods and mathematical analysis, modeling of hydrological processes and handling of large data sets. Furthermore, the candidate must have excellent personal skills and be able to work in a team. Experience with hydrogeological and / or geophysical field work is highly desirable. The successful candidates will receive an attractive salary in accordance with the MSCA regulations for early stage researchers. The exact salary will be confirmed upon appointment and is dependent on the country correction factor (to allow for the difference in cost of living in different EU Member States). The salary includes a living allowance, a mobility allowance and a family allowance (if married). The guaranteed PhD funding is for 36 months (i.e. EC funding, additional funding is possible, depending on local supervisor). 41 425,20€ + 7,200€ (for mobility allowance) + €6,000 (for family allowance, if eligible); this is before any applicable tax and/or deductions. Cover Letter, stating your motivation and background for applying for the specific PhD project. IN ENIGMA, we wish to recruit ESRs that reflect the diversity of society and thus welcomes applications from all qualified candidates regardless of personal background. There will be a first round of evaluation between January, 23rd and January, 31st. There will be two other evaluation processes in March 2017 and in June 2017.